Planning for People: A Community Charter for Good Planning spells out the planning system changes that many organisations are asking the NSW Government to introduced in NSW. John Mant looks at what the Charter could mean for strategic planning in NSW. The Community Charter for Good Planning NSW – Planning for People – (Spring 2014 ISV) sets out for the state government what should be achieved in any future reform of the State’s planning system. Judging by its last effort, the government needs all the help it can get. The Charter was drawn up by representatives of a wide range of community, neighbourhood and environmental organisations including Inner Sydney Regional Council. It sets out the principles, expected outcomes and mechanisms required to achieve good planning. The Charter itself is quite short. There is a longer companion document which acts as a more detailed guide on how planning should be changed. The companion urges mechanisms through which land use planning decisions can be effectively integrated with other Government decisions relating to infrastructure and natural resource management. This is something that planners have always talked about but have not achieved. To achieve that elusive integration, the Companion document recommends a distinction should be made between strategic planning and development assessment. This article describes the differences between what I have called planners’ strategic plans and, for want of a better description, effective strategic planning. Since the 1940s, when legislation for Urban and Regional Planning first was introduced, strategic planning and development assessment have been not seen as separate exercises but, rather, two sides of the same coin. In the 1940s the new profession of planning had to muscle in to the existing silos of the very traditionally structured state and local governments. Despite many bureaucratic turf wars, planners have only been partially successful. While their plans are called “strategic plans”, they are essentially coloured maps that separate land uses. The powers of each traditional silo to do its own silo ‘strategic’ planning remained unintegrated. Subsequent planning legislation, actual or proposed, still only gives the Planning Department the power to set up a system for controlling land uses. The Department does not have the power to direct the activities of the more powerful silos, such as roads, transport, mining, water, education, health and so on. A recent example is the planning for WestConnex. This ill-considered project has had little regard to the planners’ strategic plan for Sydney, which has as its core objective reducing, rather than reinforcing, the dominance of the CBD. WestConnex is a classic example of a simplistic silo solution to a complex set of strategic issues. In the end urban planners only pretend they are in charge. Population is projected to some fixed date in the future. This projection is converted, first, into households, and, second, into a demand for houses and jobs. The physical and natural geography of the area to be planned is assessed and land that can potentially accommodate the increased demand for houses and jobs is identified. An assumption is made about what percentage of growth will be on “greenfields” land and what percentage will be by way of redeveloping existing urban areas. Certain standards are then applied to identify the percentages of specific land uses that will be needed for the new and redeveloped land. The “cadastral plan” (a plan showing property boundaries) for the area is then coloured in to reflect the existing, the new and the redeveloped land use zones. Written controls to support the separate zones are prepared. The product of this type of strategic planning is a coloured cadastral map. ‘Strategic planning’ starts with the assumption that all uses will be separated – traditionally this has been into detached house zones, medium and high density zones, shopping areas, commercial areas, industrial areas, schools and open space. A ‘special uses’ zone is used for uses that don’t fit into one of the standard zones. While recently these zone names have been given less descriptive titles, the intent remains the same. Because the product of planning has to function as both a strategic plan and as the basis of land use regulation, every parcel is zoned. The future land use pattern is fixed, even though, given the time taken by the planning exercise, the assumptions on which the plan was based can be out of date by the time the plan is published. Publication of the plan fixes land values and makes difficult any future changes that could reduce values. Windfall gains potentially are granted to those landowners who benefit from an up-zoning. Mechanisms designed by government to capture some of that value may, or may not, be imposed at that time. Imposing them after the zoning map has been published can be difficult. Overall, the assumption is that the major objective of planners is to separate land uses, rather than, for example, do whatever it takes to create ecologically sustainable development. We can contrast planners’ strategic plans with effective strategic planning. The process is different, as is the product and its effectiveness. Instead of an “end state” cadastral plan for some date in the future, an effective strategic plan is a management tool setting out what needs to be done if a particular vision of the future is to be achieved. This type of strategic plan can be done for any scale of problem and any scale of time. Vision – With a plan for an urban or regional area, those doing the planning (this could and should include the widest range of people interested in the issues) should articulate in descriptive (not abstract) terms the desired vision of the future. So a physical description rather than words like vital and beautiful. SWOT – A traditional SWOT analysis then looks at where we are now, and analyses what is going to assist us to achieve the vision and what are the strengths, weaknesses, opportunities and threats. Strategies – Next, how, in broad terms, is each objective to be achieved? Is a supply or a demand strategy to be followed? Or a combination of both? Actions – Having identified the strategy or strategies to be followed, the team then needs to identify what actions are required to achieve the objectives. Who has to do what tomorrow? The reality of the necessary actions occurring will test the reality of the vision, objectives or strategies, which may need to be adjusted. The output on a planners’ strategic plan is a set of zones and accompanying development controls. The controls are the plan. By contrast, for an effective strategic plan, zoning and development controls are merely a strategic action that may be needed to achieve an objective to achieve a particular vision. A highly effective strategic plan might, in fact, need few changes to land uses. Some time ago in a distant city a typical planning authority was called on to provide a new metropolitan strategic plan. The existing very traditional end-state land use zoning plan had reached its nominated end point. At the time an optimistic population projection was expected and therefore the strategic planning team had in process the identification of large new areas for rezoning, subdivision and development. A new planning department was imposed over the traditional planners’ organisation. This new department was then staffed, not just by the urban planners, but also by urban economists and those experienced in analysing the drivers of urban development and their social consequences. A strategic analysis identified that the major cause of the development of the proposed new areas were demands from the public housing authority, whose tenants benefitted from rents based on the actual cost of each new house, and cottage builders whose customers benefitted from subsidised loans, provided they were for first homebuyers buying a new house. At that time, in the middle-ring suburbs, where there were schools, bus services and other facilities with declining customers, some existing houses cost less than it cost to construct a new house on the outer fringe. To stop bribing new first home buyers and public housing tenants, the latter increasingly unemployed, to live on the fringe, the strategies and actions of the new strategic plan changed. Instead of new rezoning cheap fringe land, action was taken to change the terms of the Commonwealth State Housing Agreement. More first home buyers were able to get cheap loans to buy existing houses. The housing authority was able to charge rents on a different basis than the cost of the particular house being rented. It became possible to adopt a much wider range of solutions to adding to the public housing stock. The strategic planning changed from a supply solution (that is, rezone more development land) to a demand solution (changes to the bureaucratic drivers that were creating what was judged to be an increasingly inequitable city). The strategic outcome led to considerable savings to the state budget and a better social structure for the metropolitan area. The city was also better able to cope when some of its major industries declined. The strategic plan did provide an important supply strategy – the rapid development of a high amenity new suburb directed at second home buyers. In time, some of the cottage builders changed their products to take advantage of this and redevelopment opportunities in the inner suburbs. Effective strategic planning should be done on a whole of government basis. It should be able to overcome the silo mentalities of the very traditional organisation structures to be found in state government and in local government. Effective strategic planning is both meaningful and capable of being participated in by everyone in the community. However, effective strategic planning should be much more than merely the list of wants all too often found in community ‘plans’. It must identify how those wants are to be supplied. A wide selection of strategies should be available, rather than the single strategy of a planners’ plan – the separation of future land uses. A pathway from now to the future can be produced, rather than a static end state plan. An effective strategic plan can and should be revisited regularly because things change and different opportunities arise. The City Council’s 2030 Plan was more an effective strategic plan than the land use zoning plan that followed as one of the strategies. 2030 has been successful in driving the City’s direction for the last ten years. 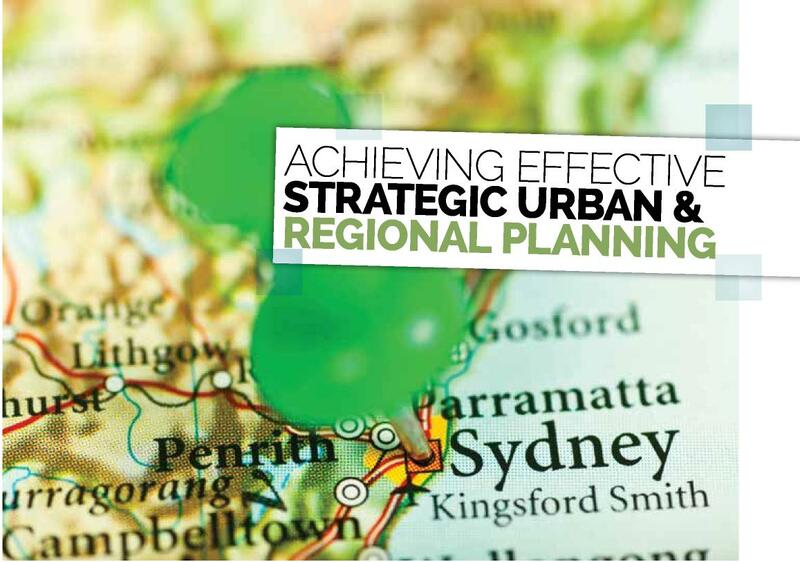 The Community Charter for Good Planning proposes that a unit of strategic planning policy be created to prepare an effective strategic plan for the future of Sydney’s metropolitan area. There is a strong case for responsibility for this unit to be in the Premiers Department and for the Planning Department to be renamed the ‘Development Control and Assessment Department’. This would signify a real shift to effective strategic planning and would encourage the current ‘Planning’ department to concentrate on creating a more skilled and transparent development assessment service. John Mant is a planning lawyer and Councillor on the City of Sydney City Council. His CV includes rewriting the NSW Local Government Act, being a NSW ICAC Commissioner and reforming the planning system in South Australia.